In the past month, since my last rover update on December 22, 2016, Curiosity has begun moving again, carefully picking its way through the dune-filled flats in the foothills at the base of Mount Sharp. The route taken, shown on the image on the right, corresponds to the easternmost of the possible routes I noted in my November 14, 2016 update. This route is also the most direct route, which I think is smart considering that the rover’s life on Mars certainly uncertain and the higher they can climb the more geological information they will get. I have also annotated the likely route into the near future, including a possible side trip to the base of the mesa up ahead. It appears to me that they are now a little more than halfway through the flats, with Mt. Sharp directly ahead, as shown by the panorama below, taken near the end of December. The goal is a canyon just out of view to the right of this panorama. The flats the rover is presently traversing, and visible in the foreground of the panorama above, is strewn with dark sand that often piled into large sand dunes. Where the ground is exposed, it is made up of a scattering of pavement-like rocks. As noted in a press release yesterday, many of these flat rocks have polygonal cracks and boxwork similar to that seen in dried mud here on Earth, suggesting that this area was once wet and then dried. 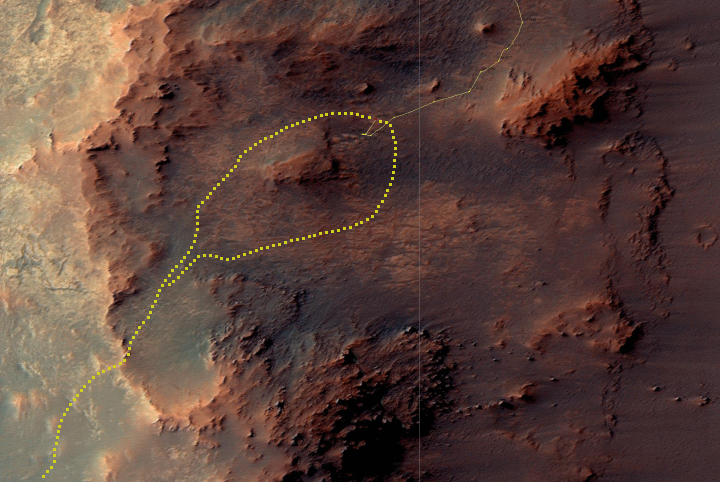 This geology helps confirm the theory of planetary scientists that Gale Crater was once filled with water that slowly evaporated away. As the rover climbs, it leaves the lakebed and begins to move through the lake’s various shores, each one older than the last. In the month since my last update Opportunity has been slowly working its way up the steep slopes of the interior rim of Endeavour Crater. From what I understand and noted in that December 22 update, they wish to take the rover out of the rim and head south to a gully that appears to have been formed from flowing water. Getting out of the rim however might not be so easy. 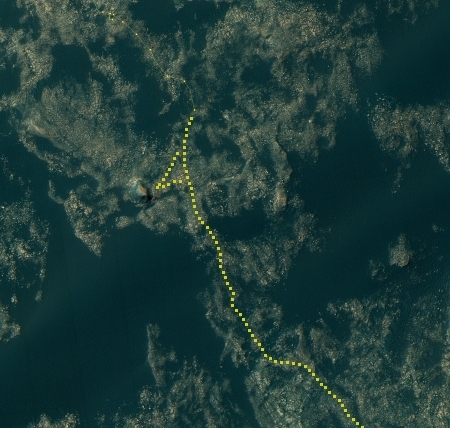 If you look at the annotated version of the most recently released traverse map below, you will see that the rover appeared to go west and uphill in a straight line, than backed off to the northeast. At about that time the rover began taking a lot of images of the ground, showing its rover tracks digging into soft dirt, as shown in the image on the right, taken on Sol 1591 by the navigation camera. 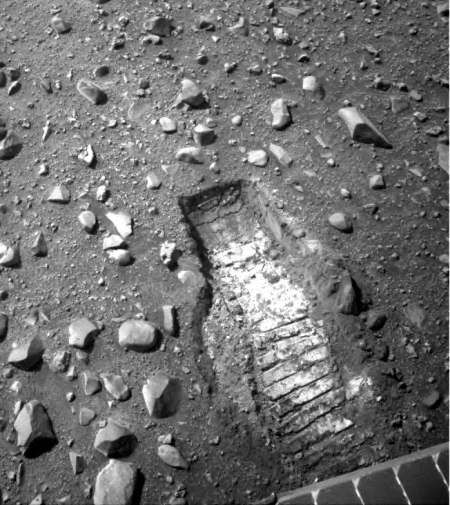 It is my guess that the rover started to hit deep sand, and was told to retreat because there were doubts they could get through. It appears they are right now trying to consider a route out of the crater. 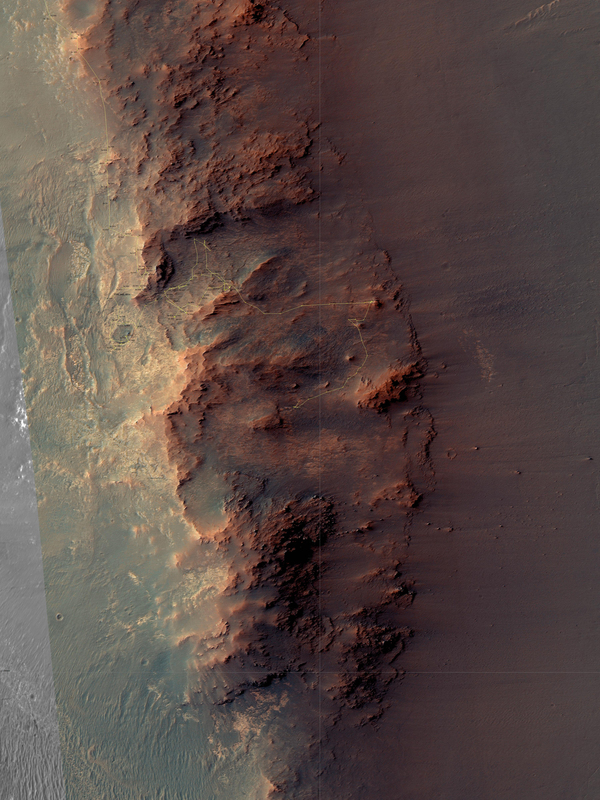 All the images taken in the past two weeks continue to show the rover climbing, but it is unclear exactly where it is. The traverse map above is about ten days out of date. I have annotated two possible routes. Based on the images, I think they are taking the more northern of these routes, but I admit I really have no idea where they are heading right now. The terrain ahead does not look easy, so it could be that they are moving slowly so as to avoid getting trapped.